Attack in Judea targets young couple with baby in car - stone hits father in head and causes car to flip, critically injuring him. 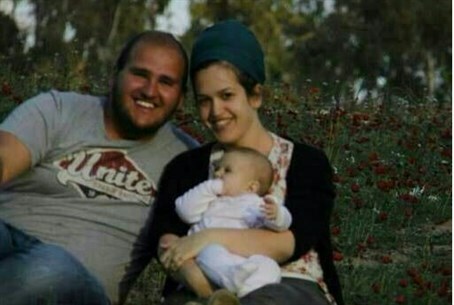 Yedaya Sharchaton was driving with his wife Hadasah and one-year-old daughter Nitzan in Judea on Saturday night, when suddenly Arab terrorists threw rocks through the windshield, hitting Yedaya and causing the car to flip, wounding him critically in the process. Arutz Sheva spoke to Yedaya's sister-in-law Tehila Malka, who like the Sharchaton's lives in Yatir to the south of Hevron. She described the attack which occurred near Beit Umar, an Arab village in the Har Hevron region that has flown Nazi flags on numerous occasions. The Sharchaton family was on its way back to Yatir at 12:30 a.m. on Saturday night after a visit to their parents in Jerusalem. Just after passing Karmei Tzur, directly south of Beit Umar and to the north of Hevron, the terrorists launched their attack on the Israeli car. The stone broke right through the windshield, striking Yedaya as he drove and causing him to lose control. Somehow he managed to direct the car towards the safety barriers, flipping into the ditch on the side of the road. Hadasah and Nitzan miraculously emerged unhurt from the incident. While contacting emergency services Hadasah, a nurse by profession, began treating her badly wounded husband. Local Arabs stopped at the scene, offering to help; likewise a Red Crescent ambulance reportedly pulled over as well. Minutes later an Israeli ambulance arrived, giving Yedaya first aid and transporting him to the Hadassah Ein Kerem Hospital in Jerusalem, where he was put on a respirator and anesthetized. Malka related to Arutz Sheva that Yedaya's doctors are waiting for him to wake up so as to confirm the effects of the serious blow to the head that he received, given the potential for lasting damage in such an injury. "Stones are just as dangerous as rockets"
The daily terrorism of stone attacks on the road leading to the Har Hevron area has turned into a daily reality that slips under the media radar, argues Malka. Indeed, residents of the area demonstrated against the unabated terror on the roads with a car convoy protest in May. Har Hevron Regional Council head Yohai Dimri also spoke to Arutz Sheva about the attack, saying "the terrorism of stones is unbearable." "This isn't the first time that it's been proven rocks are just as dangerous as gunfire or a rocket," emphasized Dimri. "I gave IDF commanders the message that the IDF must act so that every citizen will be able to travel and arrive home peacefully, and to take every step necessary so as to accomplish that. Every terrorist who throws stones to kill needs to know his blood is on his head," warned the regional council head. The attack comes just after senior Palestinian Authority (PA) official Jibril Rajoub said two weeks ago that his organization has made a "political decision" to support Arab terrorists "slaughtering" Jews living in Judea, Samaria and eastern Jerusalem, giving them a free hand. PA Chairman Mahmoud Abbas's Fatah faction this month announced a full return to terrorism, declaring "open war" on the Jewish state - calls that have already been acted on in numerous attacks.